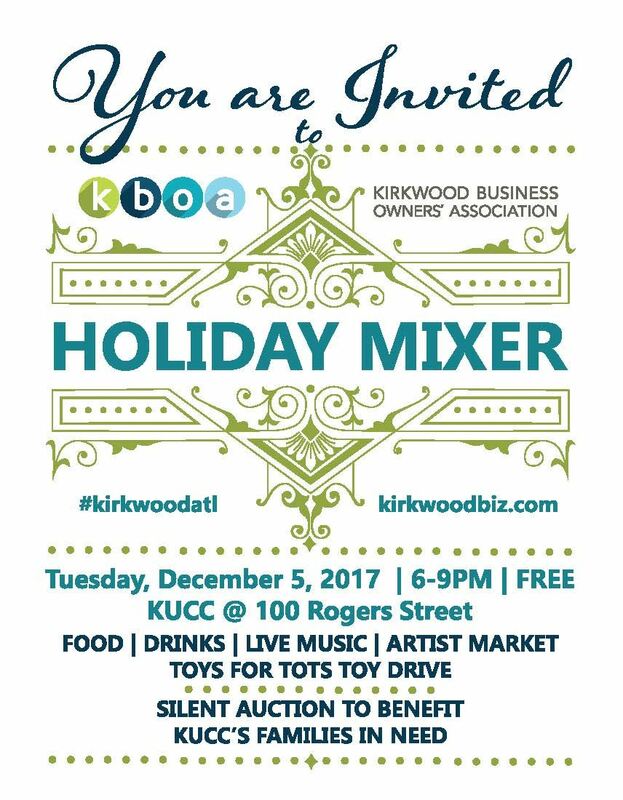 Come eat, drink, and celebrate another successful year with KBOA! All Kirkwood business owners, neighbors and friends welcome to register for this FREE event. The event will include food, drinks, live music, artist market, Toys for Tots drive, and a silent auction to benefit KUCC's families in need program. Come bid on some amazing silent auction items from the following businesses: Amy Langer, REALTOR®, Atlanta Clay Works, Kirkyard Public House, Happy Mango, Language International Kids, Augusta Designs, Indigo wellness, Poppa Corn's Gourmet Popcorn, Elmiryachi, Urban Pie, Scout & Arrow, Guitar Shed, Delightful Sites, Smugs Fitness, Conscious Health Meditation + Wellness, Trophy Room Barber Shop, Law Office of Paige Arden Stanley, LLC, Kirkwood Car Wash, Stephanie Howard Photography, Clue Town Books, The Music Class, Inc., Suzy Shultz, Addison Hill Photo, Lee Van Photography, Lynn Reeder.